Upon arrival last weekend, I was very impressed with the transformation that has taken place there. No longer is it just pretending to be a rich man in a poor man’s shirt. The aurora is truly rising behind this solid meetings destination. With the recent opening of the Harrah’s Waterfront Conference Center in the marina district, this is now one of the largest and nicest meetings spaces on the Atlantic seaboard, just over the Jersey state line. 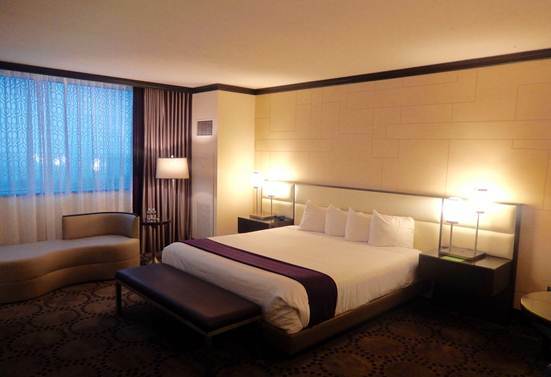 Harrah’s offers over 2500 newly renovated sleeping rooms and two stacked 50,000 square foot ballrooms, each breaking into 30 sections. 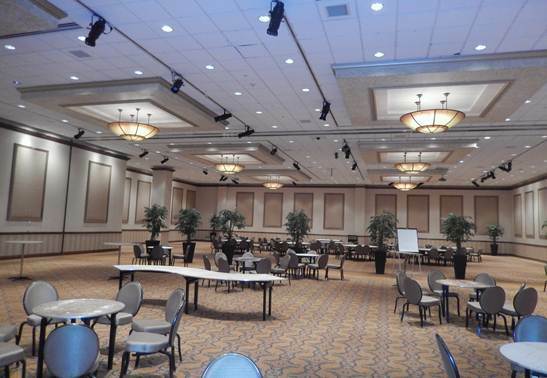 The pre-function space in the conference center was huge, each level had over 25,000 square feet outside the ballroom. They also had outdoor terraces with amazing bay and ocean views. The flexibility of their meeting space was unsurpassed and impressive. …Sleeping at the beach all night. 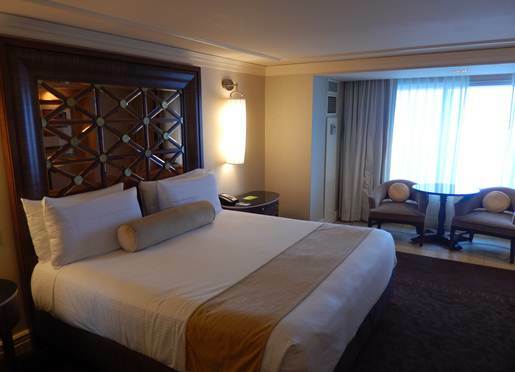 The sleeping rooms were divided up into several towers, all have recently been remodeled or are brand new. The vast majority of the rooms have great water views. The elevators were very fast and efficient, something that is often forgotten at a hotel of this size. All the rooms I saw were incredibly nice, with spacious separate tub and shower, with exceptional lighting and counter space. Everything you need to put your makeup on and fix your hair up pretty. The beds were plush and the internet was fast, not much else you need to have an enjoyable stay. …I ain’t here on business, I’m only here for fun. One of my favorite features at Harrah’s was the massive indoor pool that they turn into a concert venue at night. This is a perfect reception space for up to 400 people. The complex has dozens of restaurants at all price points, ranging from high end steak houses to grab a slice pizza joints. Overall, I found the food to be really good, high quality, and it was not overpriced. Several venues did live music at night, adding to the energy of the hotel. The casino was huge, but not all that noisy. They also have a large performance theater that seats 1200, this can also be used for private events or general sessions should the need arise. Harrah’s offers a very unique offering, a large Viking cooking school. 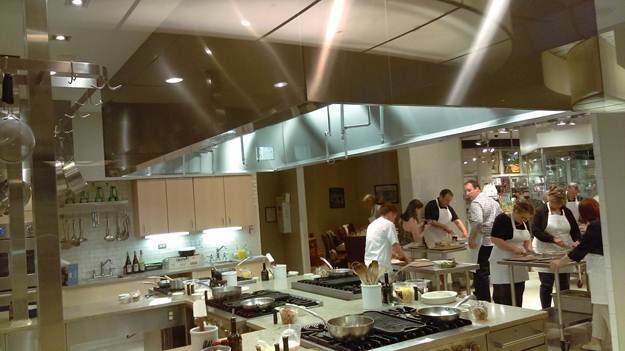 This gives people the opportunity to cook their own meal and learn from professional chefs, then eat what they made in a back room with wine parings. It looked like a lot of fun, this type of experiential activity is really popular right now. Over in the center of the boardwalk is Caesars Palace, an 1100 room hotel. This hotel is smack in the center of the action. This is a miniature version of the iconic hotel in Las Vegas. 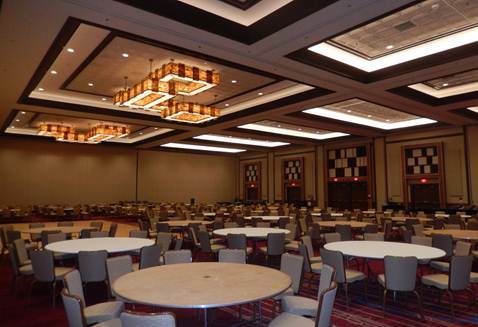 They have 28,000 square feet of meeting space, highlighted by a 17,000 square foot ballroom. The hotel has some of the best restaurants on the boardwalk, Morton’s, Nero’s Italian, Phillips Seafood, and Gordon Ramsey’s Pub and Grill. This is a truly great hotel for groups of 250-300. 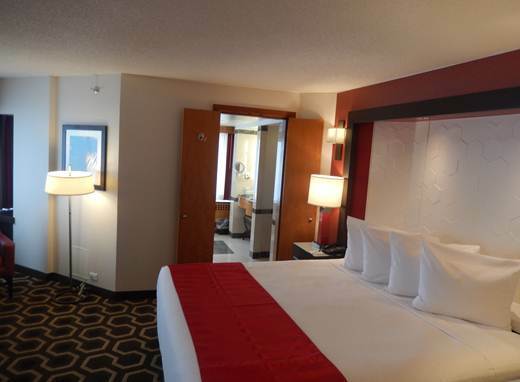 The rooms were very upscale and large, all with nice water views. Next to Caesars, is Ballys, a 1200 room hotel. Ballys is a really nice option for groups more on a budget than Caesars or Harrah’s, but still a nice product. 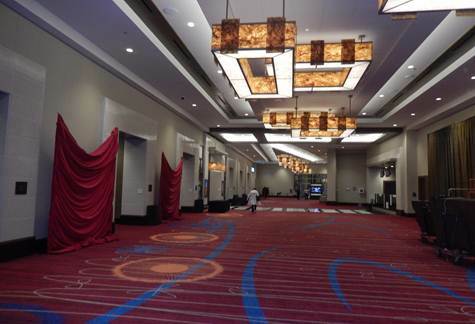 The 80,000 square foot meeting space is all on one level, making it very convenient. They also offer the largest casino floor in Atlantic City, and also have a number of restaurants at all price points. Both Bally’s and Caesars are right across from a massive outlet mall. The prices and selection were outstanding here, I am not a shopping fan, but this was one of the best outlet malls I have ever been to. …Never gave no thought to landing. The Atlantic City airport has very limited service, right now only Spirit flies in there. The Philadelphia airport is about an hour away, giving you a ton of flight options. This time from the airport should not be a huge impairment to booking there, as it is often an hour or more to get to the main downtown hotels in cities like Chicago, LA, New York, Houston, and plenty of other cities. 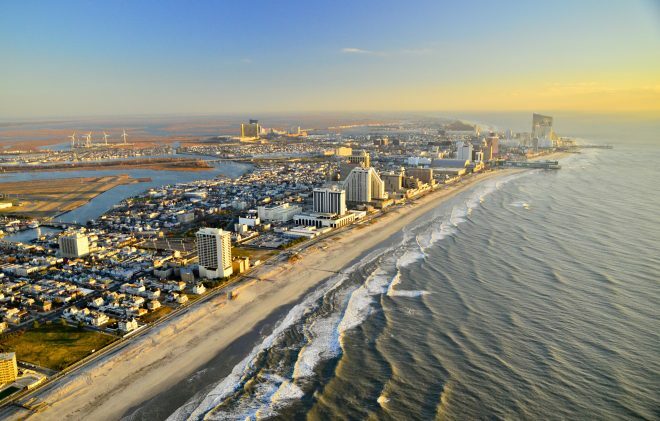 As an added convenience, one-third of the US population is within one tank of gas to get to Atlantic City, tearing down the highway like a big old dinosaur. So Mary, climb in…We’re pulling out of here to win. …Cant start a fire without a spark. For many people, the first thing that they think of when entering a casino is the amount of smoke that is used to be omnipresent. The filtration systems that casinos have installed recently has changed this reality. I spent extensive time at three large casinos and never once smelled smoke in any public area. The meetings spaces are all non- smoking, as are the restaurants. In years past, it was impossible to enter a casino without smelling like an ashtray, but these are better days shining through now, making this a non-issue in most casinos. I was impressed by the transformation that the city and the hotels that I visited has undergone. It is a city I would enjoy going back to, and one I can see bringing groups of all sizes to in the future. There is still a lot of value to be found here, especially for groups booking during the week. It has all of the amenities that my groups are looking for, and is perfect for those groups that has a big driving contingent and those looking at the Northeast. I will say it again, Meet me tonight in Atlantic City. All photos were taken by Timothy Arnold, May 2018. Most quotes shamelessly stolen from the immortal Bruce Springsteen.